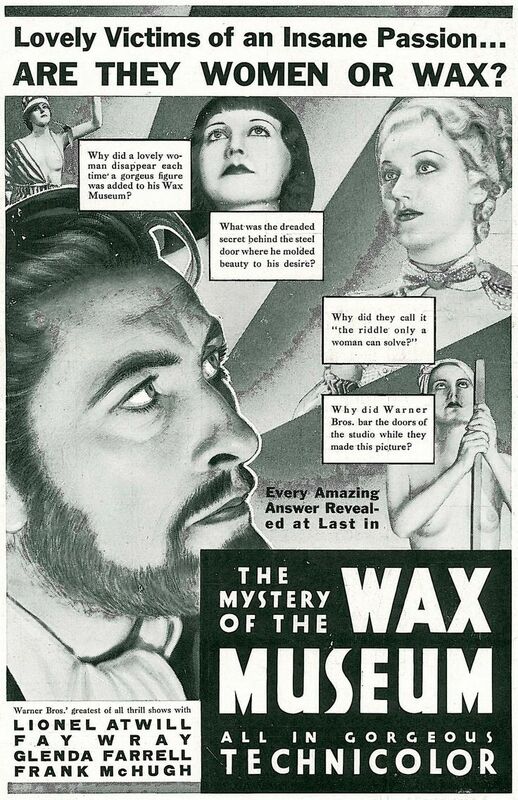 Mystery Of The Wax Museum (1933). The disappearance of people & corpses leads a reporter to a wax museum and a sinister sculptor. "Overall, it isn't that great of a movie, it drifts around instead of getting 2 the point & is overtly silly @ times (which does admittedly make it fun enough 2 sit thru, but I could've gone 4 more chills), but serves its purpose well @ bringing the concept 2 the screen that would later be perfected 20 yrs later. The best part about the film is easily the set design & use of shadows, offering up much of the mood that is infrequently on display throughout the running time. Next 2 this, the burning sequence @ the start has more of an authentic & ghastly look 2 it as the wax figures melt & crumble around the fire that not even the fantastic remake could improve upon. I just wish it resolved its plot/pacing issues so that the actors would've truly been able 2 shine w/ the material, as there's still a few impressive performances spread throughout it."